Legendary musician and humanitarian Yo-Yo Ma makes his long-awaited New Zealand debut in Christchurch, performing Johann Sebastian Bach’s Six Suites for Unaccompanied Cello in one sitting, as part of his two-year global Bach journey. 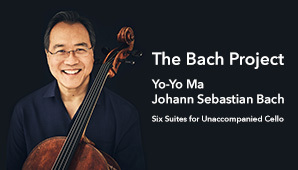 Over the next two years, Yo-Yo Ma will perform Johann Sebastian Bach’s six suites for solo cello in one sitting in 36 locations around the world, iconic venues that encompass our cultural heritage, our current creativity, and the challenges of peace and understanding that will shape our future. Please note that D Reserve seating in the Choir Stalls with a rear view of the stage. D Reserve seating will be restricted viewing. Latecomers may be admitted between suites.